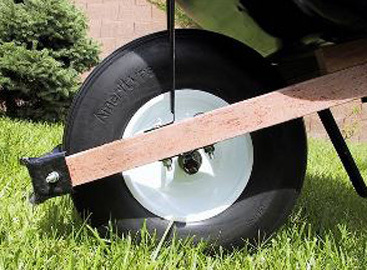 This universal fit, flat free tyre and wheel eliminates punctures on wheelbarrows. The tyre is made of lightweight, durable sold polyurethane and replicates the properties of a normal pneumatic tyre but gives full all round protection from punctures. This wheel and tyre will carry more weight than a normal tyre, is hard wearing, will never go flat, will not crack in the sun and will not be deteriorated by chemicals. No inflation is needed, the tyre is non marking, will not absorb water and mud does not stick to it like a normal tyre. Supplied fitted to a steel wheel. Delivery of this item is FREE to mainland UK addresses (Highlands and Islands extra). Delivery normally next day, if order processed before noon, but please allow three working days. We can supply Amerityre puncture free tyres for all types of lawn and garden equipment, please contact us giving the size of tyre you need and will we advise availability and price.